Seed Starting: Let There be MODERN Light! | Gardens Alive! A. Guilty as charged! (And I have probably been guilty of using equally imprecise language with at least one caller per show over the past 14 years.) But with seed starting, my intention has always been to try and get across the important point that "sunny windowsill" is actually Latin for "sorry about your pitiful looking plants", and that success requires either a greenhouse or artificial light. And when it comes to that artificial light, I always recommend four-foot long florescent tubes. But—my bad—I have just been saying "40-watt tubes", despite the fact that other styles of four-footers have come on to the market in recent years. I do this for the same reason that I call our refrigerator an ice box, refer to aluminum foil as tin foil, and say 'dial the phone' even though it's been decades since I've even seen a phone with a rotary dial. (Remember what a pain they were when somebody had a lot of nines in their phone number? It took forever!) Those are the terms I grew up with, and old habits die hard—especially for the Irish (we define thickness). And especially for the Philadelphia Irish, who have perfected thickness into an art form. Anyway, the timing of this topic is excellent, as a few weeks ago we discussed the perfect 'medium' (soil-free mix) for starting seeds, and this is a great opportunity to discuss the young plants' need for light once they are started. So here's a condensed guide to seed-starting to get us—eh, started. In brief, seeds should be sown in water-saturated soil-free mix, covered with a bit more mix and then be covered with plastic wrap and kept warm, but not hot. If you're going to do this every year, invest in a heating mat that keeps things at a constant 70 – 75 degrees, which gets the plants up fast. Otherwise, just sit the containers out in the open in a warm room and hope for the best. Check them every day and keep the mix moist. 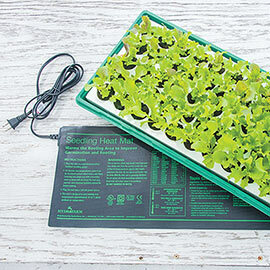 When you see the very first sprouts appear, remove the plastic and stop with the bottom heat. 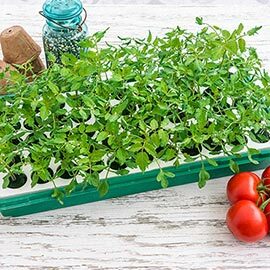 Don't wait for all the seeds to sprout; ditch the heat and plastic at the first sign of green pokiness. And then get them into bright light. Which does NOT mean your so-called "sunny windowsill". Very few (if any) windows—even South facing ones—deliver light that's bright enough to help starts grow up short and stocky, like store-bought plants. 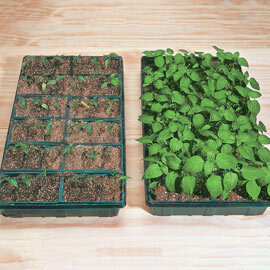 (Tall, thin seedlings are a sure sign of light deprivation.) A greenhouse that stays warm at night and vents excess heat automatically during the day generally captures enough light to be ideal for strong growth; same with an automatic venting cold frame. But if one of those you don't got, you need artificial light. Someday soon, that light will almost certainly be delivered by super-efficient LEDs. (I'm testing a 'mini garden' set-up that uses LEDs right now.) But until that confluence of affordability and super-efficient bright light arrives, fluorescents are currently the best way to deliver good amounts of light without eating up lots of energy. Over the years I have experimented with keeping some lights on 24-7 and giving other plants eight hours of darkness every night via timers. And so, based on that experience, I now recommend letting the lights go 24-7 with two tube fixtures (especially if you are cowardly about distance), and the newer compact systems that use two-foot long tubes (which have yet different 'T' numbers; oy!). Keep the tops of the plants up close to those shorter two-foot-long tubes. Oh and a final note: If this is your first year starting your own plants from seed, think of it as a learning experience. If things don't go well and your starts end up tall, spindly or dead, just buy replacement plants. Few people get everything right the first year, but almost everyone quickly becomes an expert with that first year experience in their pocket.